HyGain V AFS (PTBM121D4X) RF/S-meter replacement option? I have a HyGain V AFS (PTBM121D4X) where RF/S-meter has stopped working. It is not stucked and meter moves when I knock on the plastic. I have measured the resistance of the coil and there is no resistance at all so most likely the coil is burned for some reason. I have been trying to source a new (or used) meter but it seems quite difficult. However, both of them has not really the same scale for RF power. Any ideas as what I can use as a replacement meter or is there anyone of you who has a working one to sell me? I guess for example the meter in the Tristar 747 is the same. Any other models you are aware of that has the same meter? Re: HyGain V AFS (PTBM121D4X) RF/S-meter replacement option? Vu-mètre pour série MIDLAND/ ALAN,100M, 150M, 2001, 4001, 5001, 6001, 7001, etc. I would think pretty much any cybernet radio meter would fit, the scale insert can be changed if done carefully so you'll still have the '10' FSD reading. They're only held together with sellotape, just put new tape on when re-assembling. The meters in the links you posted wont fit they are larger meters too fit Uniden style radios, As above pretty much any Cybernet meter will fit York/Rotel etc but you wont have the 10 on the scale, To swap the decal depends on what meter you get as some did differ in design, The most popular was the one with a small "wheat bulb" that went into the side but some meters the bulb was on a bit of card that slotted from underneath these two meters the inlay is not easily interchangable. Gents, thanks for all the good info. @14CS06 / Claude: Wonderful link! I have now ordered two of those meters. Thanks! @Black Spirit and @Mitch: Thanks for the tip of moving the scale. The model I have is the one with a small "wheat bulb" that went into the side so I should be able to swap the decal if I decide to go on that path. 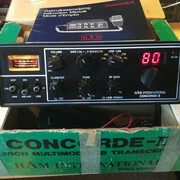 I've got a feeling a Concorde II meter would swap nicely, but can't recall what the TX power scale goes up to off the top of my head. Sorry Claude, I meant to say it's the same size but the readout plastic is different and I couldn't remember if it shows high enough on the wattage. It'd suit the radio nicely if the readout couldn't be swapped over for some reason. Wohooo! Meter replacement arrived and it was a perfect fit!